Saigon's skyline - the density is staggering. Delicate balance - Saigon xe om moto-taxi driver. Love on the streets - husband and wife team fixing motorbikes and serving drinks on the streets. Building a new city can get messy. District 1, Saigon. Afternoon cooling off in a French colonial era park in downtown Saigon. 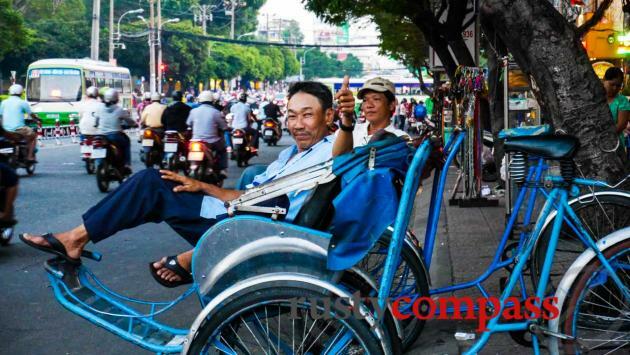 Only a small band of cyclo drivers have survived Saigon's modernisation drive. 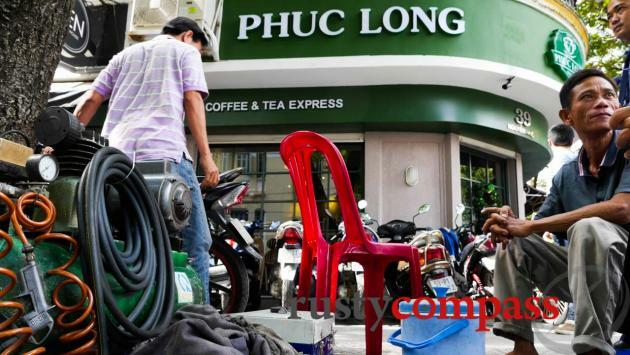 The motorbike repair man and the curiously named local coffee chain. 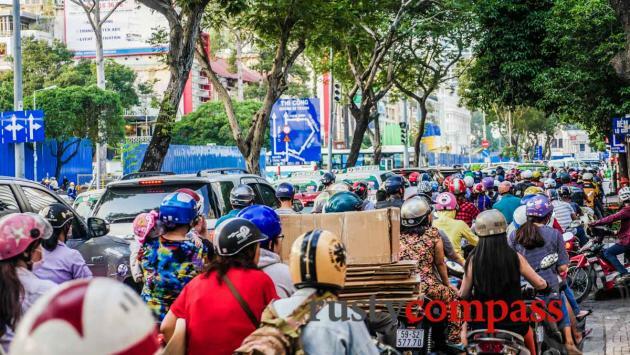 Saigon's traffic congestion gets worse by the day. The new Saigon closes in on a legendary historical figure. Ho Chi Minh City - still known to locals as Saigon - is Vietnam’s largest city and its economic powerhouse. The population has shot passed 10 million - some say it's as high as 14 million - and the urban sprawl reaches south into the Mekong Delta and west towards the Cambodian border. Saigon miraculously transcends its density and construction chaos with spirit and character - charming travellers along the way. Food - there’s no better place to sample the delicious flavours of Vietnam. And Saigon’s French and other international culinary offerings are impressive too. Click here for our handpicked list of Saigon's best eating. 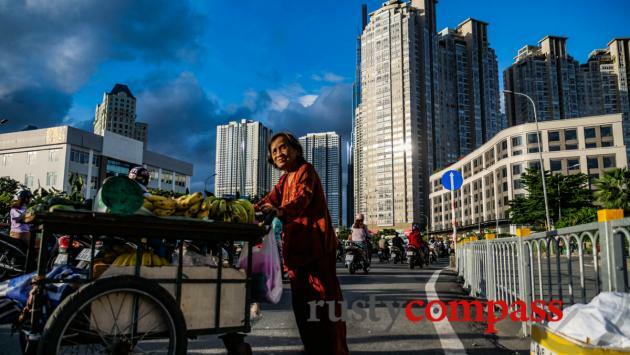 A chaotic, fast changing city - Saigon is one of South East Asia’s fastest growing cities. The chaos is exhausting and exhilarating all at once. History - A major centre of French colonial power and then the centre of US power during the Vietnam War, Saigon’s history is incredible. 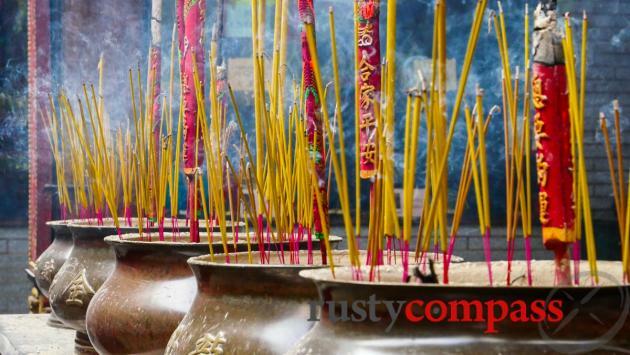 Click here for our list of things to see and do in Saigon. 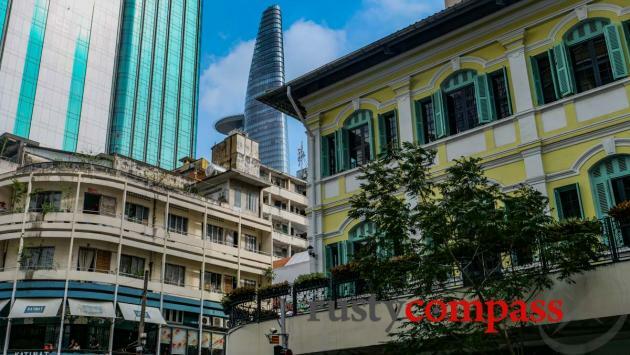 Disappearing gems - Saigon’s leaders are ripping through the city’s heritage with rapacious determination. Check out the cool cafes that are pushing back in old heritage apartment blocks. Nightlife - Saigon’s mayhem by day morphs by night into a vibrant scene of rooftop bars from the fancy to Saigon hipster with plenty of texture in between. The craft beer scene is buzzing too. Click for our handpicked list of Saigon's best nightlife. 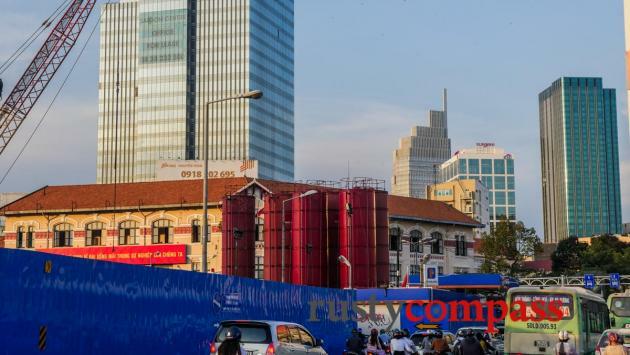 Downtown Saigon is in a state of construction upheaval as work continues on a Metro scheduled to commence operation in 2020. Along with other construction work, the disruption is most serious in the city's heart along Le Loi St from the Opera House to Ben Thanh Market. 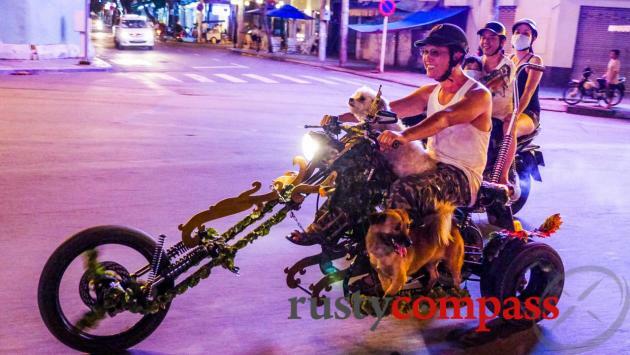 Amidst the motorcycle fumes and the construction dust, an irrepressible Saigonese energy and optimism endures. Don’t be surprised if you’re charmed by this place, despite your best instincts. Saigon has spent more than half a century in near constant turmoil - which may explain its residents’ incredible tolerance for disruption and change. 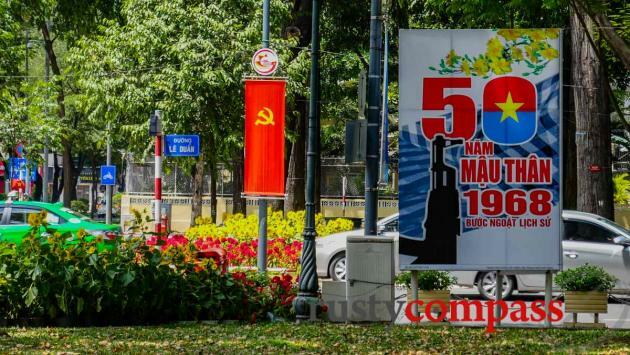 French colonials, Japanese invaders, the rabid anti-communist Ngo Dinh Diem and his corrupt American sponsored successors, all had their time here before Ho Chi Minh’s forces took over in 1975 and renamed the city in his honour. From there it was more than a decade of penury as communist hardliners applied stiff medicine to cleanse the city of its decadent capitalist ways. The result was famine, a massive outflow of boat people and, in the late 80s, a belated decision that perhaps some market forces should be tolerated. Ever since, Saigon has been at the epicentre of Vietnam’s two decades long experiment with market reform. Its population has swelled, its economy has boomed, corruption has soared and a new class of hyper wealthy have traded hammers and sickles for Hummers and Louis Vuitton. While Saigon’s cafes are perennially busy serving the city’s new rich, for the majority, life is still a grind of long hours and low wages. But you’ll struggle to find anyone who doesn’t concede that things have improved plenty in the past two decades. 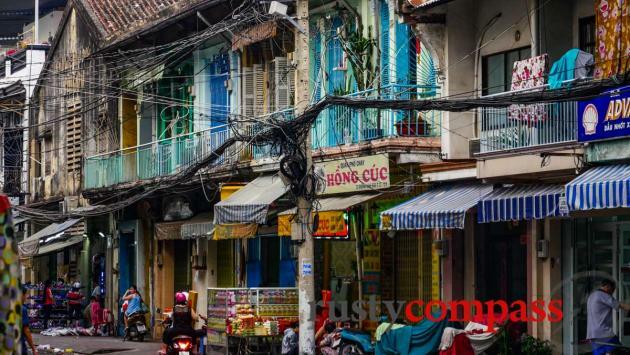 Saigon may have been known as the Paris of the East in the 50s and 60s, but these days, it’s a bustling architectural shambles. Some French era boulevards and architectural icons remain. For the most part though, the city’s colonial architectural heritage is going the same way the repressive French colonial administration did decades ago - down. And while modern day Ho Chi Minh City has plenty of attractions, pleasing architecture and public spaces are not among them. In a depressing binge of self-harm, Saigon's leaders seem determined to cleanse the city of the modest heritage assets still standing. Even Dong Khoi St, the main street since French colonial days, hasn't been spared. Grand old apartment blocks, department stores and shophouses that lent the city some old-world charm, have disappeared. More heritage demolitions are planned. Their replacements have done little to improve the visual quality or the amenities of the city. Saigon's colonial past might be disappearing, but juggling past and present is the sport that makes the city such a uniquely compelling place. The War Remnants Museum, the former Presidential Palace and the Cu Chi Tunnels are compulsory stops on any itinerary. But these relics of a war that put Vietnam on the geopolitical map, seem more consequential to baby boomer tourists than contemporary Vietnamese. 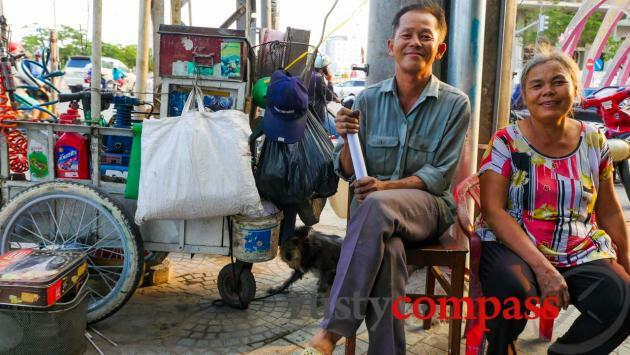 With one of the youngest populations in Asia, Saigon oozes youthful, friendly energy, optimism and good humoured cheek. And it’s Saigon’s rosy outlook that continues to see Vietnam rank highly in global optimism measures. Even the Vietnamese can’t resist the place. The city is packed with emigres from all over the country - a remarkably large number of them from the proud, victorious capital Hanoi. Saigon is up there with Asia’s best culinary cities. The delicious distinct flavours that mark out Vietnam’s south, centre and north are all plentifully showcased, as is an impressive turnout of other Asian and western cuisine. After you recover from the initial shock, it’s easy to be swept up in Saigon’s infectious positive energy. Exploring the the history, the food, the shopping and simply gazing at the constant activity, will easily keep you busy for three days. For more details, read on! 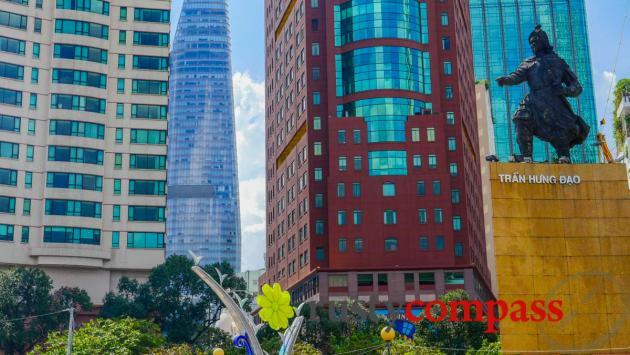 Most travellers will either commence or conclude their Vietnam travels in the country's biggest city and southern hub, Ho Chi Minh City (Saigon). Here are some hints for getting to and from the city. As of 2016, Saigon has a cheap, good quality airport bus service from both international and domestic terminals. The cost is 20,000VND (less than 1USD) to the city. There are counters at airport terminals. The route is numbered 109 and is operated by a distinctive yellow bus. It drops off and picks up at selected spots around the city. You may still need a taxi for the last leg to your hotel - even so, you'll be well ahead. If you're taking a taxi, best to go with Vinasun, Mai Linh or Vina Taxi. Avoid dodgy guys hanging around outside the airport terminal. A taxi to the centre will cost around 150,00VND (early 2018). For slightly more you can remove the risk of being ripped-off and organise a fixed price private vehicle in the terminal. Ho Chi Minh City’s Tan Son Nhat airport is the country’s busiest, serving direct flights from most major Asian cities as well as long haul points in Europe and Australia. It's so busy that it is starting to experience delays with aircraft congestion. 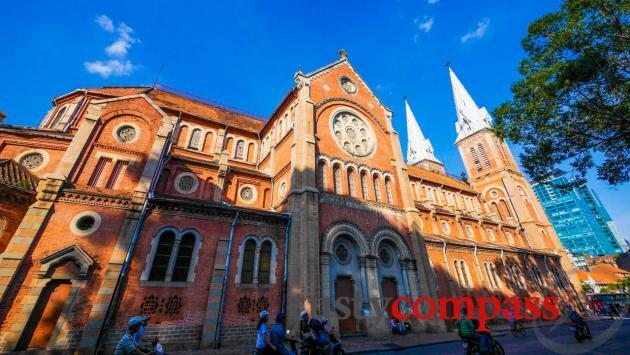 Jetstar, Air Asia and Tiger Airways offer low-cost flights into Ho Chi Minh City from various South East Asian points. Local player Vietjet is also worth checking out. Ho Chi Minh City’s airport immigration arrival process has gone from being one of the worst to one of the best. It's usually very swift. The exception is if you’ve pre-arranged a visa to be issued on arrival (these MUST be pre-arranged). This process is still a debacle. Otherwise, you’re a good chance to be through immigration and customs and on your way in less than 45 minutes. It’s when you get outside the terminal that things get complicated. 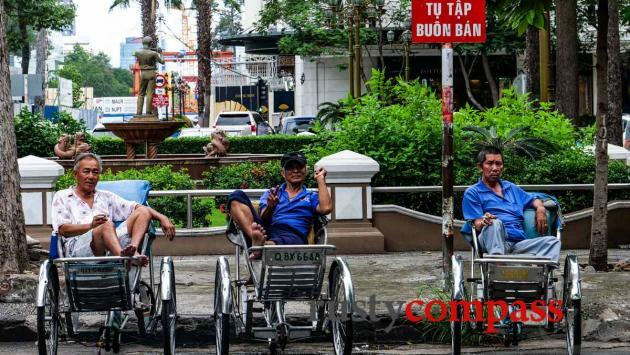 For more information on getting into the city, see our “getting around” Ho Chi Minh City page. There are three domestic carriers. Vietnam Airlines, Jetstar Pacific and Vietjet operate multiple daily flights from Ho Chi Minh City to major points like Hanoi, Hue, Danang, Nha Trang, Dalat as well as Con Dao and Phu Quoc Islands. Daily flights operate to most other population centres in the country as well. Vietjet is the upstart budget operator that’s shaking the market up. Saigon's railway station is around four kilometres from the city centre and is served by taxis. 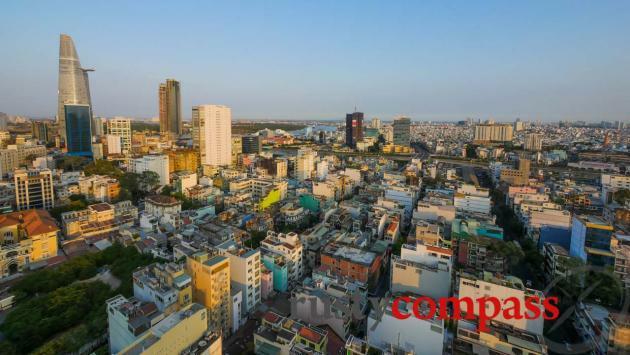 Insist on a metered fare which should cost less than VND80,000 to or from the downtown area. 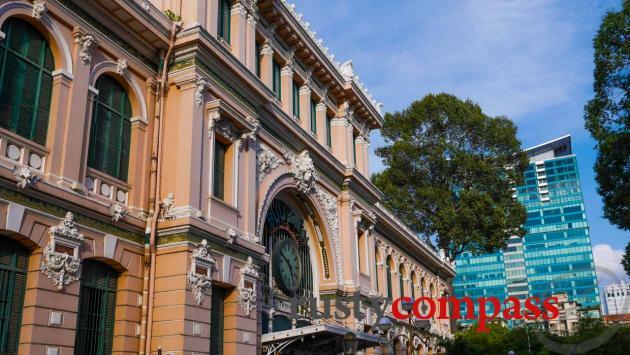 Vietnam's north-south rail network terminates in Saigon. Rail services operate to and from all major points along Vietnam's coastline. Train travel is especially popular to the beach town of Phan Thiet (accessing Mui Ne - 4 hours approx.) and Nha Trang (8 hours approx). Some travellers choose to take the Reunification Express all the way to Hanoi stopping along the way at points like Nha Trang, Quy Nhon, Danang and Hue. Saigon is a convenient point of arrival and departure by road to and from Dalat (approx 7 hrs), Phan Thiet (approx 4 hrs), Mui Ne (approx. 4 hours) and Nha Trang (approx. 8 hours) to the north and the popular Mekong Delta towns of Mytho (1.5 hrs), Cantho (approx. 3 hrs), Chau Doc (approx. 5 hrs) as well as road travel to Cambodia (Phnom Penh approx. 5 hrs). The good news about Saigon is that most things you're going to want to see in the city are in a relatively small area that can be managed on foot, by cyclo or by taxi. The bad news is that the Saigon traffic is bad and getting worse by the day. Even short distances can be a headache. And walking can be unpleasant too. Your first Saigon challenge will be getting a taxi downtown from the airport. As soon as you exit the terminal, you’ll be accosted by a man looking semi-official who’ll ask if you need a cab. Just keep walking. His charge will be somewhere between US$25 and US$50 - more than four times the going rate. Head straight to the taxi queue - though it’s also complicated. Vietnam’s taxi companies are wildly variable in quality and the worst taxis are extortionate bordering on criminal. To minimise the risk of a very unpleasant arrival experience, ask for a Vina, Vinasun or Mai Linh taxi. You may have to wait since the good companies are in big demand and those in the know avoid the dodgy operators. When you get in your taxi, make sure the driver turns the meter on. Some will harass you for extra payment because it’s an airport pickup. Expect to pay around VND150,000 (around 7 USD) to get to the downtown area. A 20,000 to 30,000 VND tip is a nice gesture if you get a good driver. You can cut the pain of the taxi process by booking an airport taxi in the terminal. These are US$9- about $2 or $3 more than the usual meter taxi but probably worth it for first time arrivals. Cars and drivers aren’t great but you’ll avoid the messiness of the taxi system. The 6km ride downtown is between 30 minutes and 60 minutes depending on the traffic. Taxis are an inexpensive and convenient way to get around - providing you avoid the dodgy operators. Our favourite taxi companies are Vina Taxi (yellow colour) Vinasun (white with green stripes) and Mai Linh. There are other newer companies that are also OK.
Uber recently withdrew from Vietnam and other Asian markets leaving Grab as the main player. There are many complaints about the quality of the monopoly service. Driver standards are variable - as they are with taxis! Grab also offers motorbike taxi services. Beware of dodgy taxi companies that congregate around tourism hotspots like the War Remnants Museum, Ben Thanh Market and late night venues like - especially in the backpacker precinct, preying on travellers not aware of the scams. Apart from being particularly nasty, their fares are often two, three or four times the going rate. The dodgy companies will tend to use old small vehicles so look for newer larger taxis. Walking is possible in Saigon but it’s rarely pleasant. Motorised transport rules - on the road and on the pavement. It means you’ll find the roads packed with motorcycles, cars and trucks and the footpaths handle the overflow from congested streets. It’s not unusual to find motorcycles mounting the footpath and riding at speed past pedestrians. Weaving your way through this is fun for about an hour. Then it becomes stressful and can consume a lot of energy. Saigonese drivers have little regard for pedestrians and will depend on you getting out of their way in all situations - whether you're on the road or the footpath - so be forever vigilant. The centre of Saigon is presently a construction site as a new Metro system is built and an enormous amount of construction is under way. Many travellers assume that miraculously the traffic chaos always works out. It doesn't. Saigon's roads kill and maim every day. Crossing the road will prove to be a big challenge. Look closely at oncoming traffic, remember that there may well be riders going in both directions in a particular lane and never assume that cars and bikes will obey red lights or pedestrian crossings. Many of the streets in the centre of District 1 are some of the least congested so negotiating these can be easier. Never be complacent though. Be aware that many travellers are robbed while walking on sidewalks and crossing roads. Hold your cameras and possessions tight. 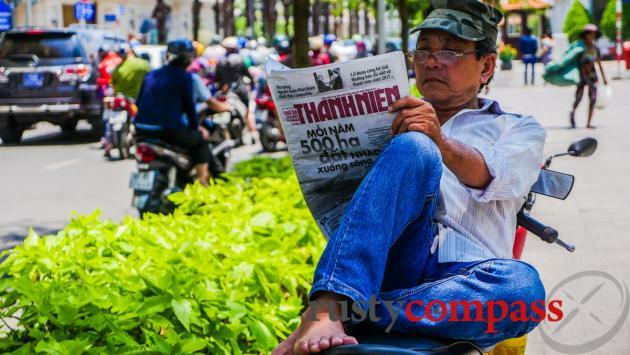 Saigon's cyclos are facing extinction as the city's motor traffic takes full control of the roads - not to mention the footpaths. Still, there are a few around major tourist spots and they certainly offer a unique perspective on the city's chaotic traffic. Be sure to clearly negotiate a rate in advance and remember that in these days of high inflation in Vietnam, a cyclo is usually a more expensive way to get from point to point than a taxi. Some travellers have reported nasty experiences with cyclo drivers threatening them and grossly overcharging. Be careful and be absolutely clear on your pricing. Cyclos seem to be demanding around 50,000VND - 70,000VND per hour these days. Motorcycles taxis (known as xe om which translated literally means "hug bike" as you have to hold on to your driver to stay on) took over from cyclos in the 90s and remain popular. The introduction of mandatory helmets at the beginning of 2008 made them a little less attractive to some but they are still a quick, fun and occasionally hair-raising way to get around. Like cyclos, make sure you name your price first. Uber and Grab both offer services motorcycle taxi services in Saigon. Information fot travellers about scams, crime, safety and health in Saigon (Ho Chi Minh City). 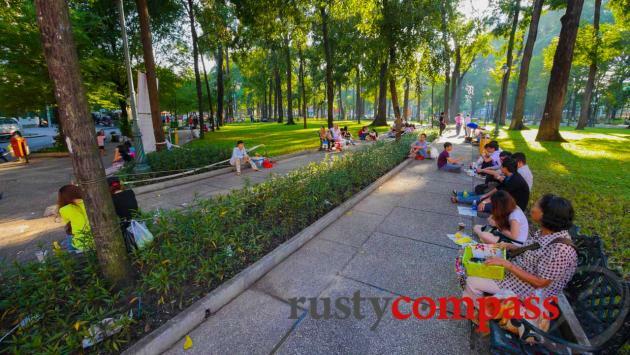 Saigon is a relatively safe destination for travellers. Violent crime against foreigners is rare. There are some hazards worth noting though and these problems seem to be getting worse. As a traveller, you’re most likely to be scammed when travelling in a taxi, a cyclo, or responding to inexplicable offers of hospitality from random people on the street or in bars. Use caution in all circumstances and don't let your positive view of humankind relieve you of your commonsense. Favour newer looking taxis and our recommended companies (see “getting around” above) and try and get a sense of the geography yourself (pick up a local SIM card with data and use the GPS on your smartphone). Bag and phone snatching: Travellers frequently fall victim to bag and phone snatchers on motorbikes when crossing the road. This is the most serious and most common problem to befall travellers. We hear of it constantly. Be very careful with your valuables. Cameras are also prized by thieves. Cyclo, xe om, taxi intimidation: At the completion of a ride, a cyclo, xe om or taxi driver may insist on a large payment (often as high as US$200) and threaten you if you don’t comply. These problems seem to be most common when travellers don’t pre-agree a price. There’s something to be said in getting some casual happy snaps with your cyclo driver if you’re doing a longer tour with them. The tragedy of these incidents is that they tar the entire cyclo / xe om / taxi fraternity - most of whom are perfectly decent. Be nice to your cyclo driver and you'll more than likely find the courtesy will be reciprocated. Taxi intimidation: Saigon’s best taxi drivers are good by any standard. Unfortunately, the worst drivers are also worthy of note. The other problem is that many of the most disreputable taxi companies copy the names and logos of the more reputable companies. An example is Vinasum taxis trading off the good name of Vinasun taxis. Keep your wits about you and remember that the more modern a taxi looks, the more reliable it’s likely to be. Taxi issues definitely become a bigger problem the later it gets in the evening. Be careful rather than paranoid. Random tour guides met on the street: A number of travellers have been persuaded by young men on the street posing as tour guides to take ‘unofficial” tours at an agreed price. At the end of the tour, the guide threatens the tourists and demands far higher payment. Late night violence: As with all big cities, the later you’re out in Saigon, the more likely you’ll witness or be a victim of crime. Stories of late night violence from the Pham Ngu Lao and Bui Vien backpacker’s area are common though probably no more so than in other international cities. One difference is that if you end up in a serious dispute with one of the bars, you may find a large number of local men throwing bottles at you. It can get very nasty. Some of the staff in bars along Bui Vien St seem to relish the occasional fight. Bottles, chairs and tables are the preferred weapons and people can get seriously hurt. Petty crime including lost cameras, bags and wallets are also common in the late hours. If you’re a victim of crime, the Vietnam police experience is likely to be unsatisfying. Reporting a crime can be a serious hassle and empathy is not the strong suit of the local constabulary. Even lodging a statement can be a hassle. Persist though, you'll need some documentation for your insurance. Make sure you have good travel insurance that includes full evacuation in the event of serious illness or accident. While Saigon is home to Vietnam’s best equipped hospitals and clinics, they’re still behind the best international standards. Regional centres like Singapore, Hong Kong and Bangkok are also superior in both expertise and equipment. Seriously ill patients are commonly airlifted to Singapore, Bangkok and Hong Kong. 3. International SOS Vietnam, Ltd.
Cafes, restaurants, bars and hotels offer free wifi pretty universally around Saigon. Speeds are usually OK too. 3G and 4G services are also good and inexpensive. You can pick up SIM cards on arrival at the airport. Viettel is said to have the best national coverage in remote areas. Vinaphone and Mobifone offer good coverage too. ATMs accepting international cards are everywhere in Saigon. Credit cards are increasingly accepted too. Amex less so.